An artist's rendering of the Nordic Aquafarms salmon farm planned for Belfast. BELFAST, Maine — The Norwegian aquaculture firm planning one of the world’s largest salmon farms in Belfast unveiled the first peek at what the facility might look like in advance of an update meeting planned for Wednesday. Nordic Aquafarms will host an informational meeting at 6 p.m. Wednesday at the Hutchinson Center in Belfast. The first artist’s rendering of the $150 million land-based farm was released as part of the company’s announcement of the meeting. Nordic expects to release more details about the site’s design and how it will operate. Nordic’s update comes on the heels of a heated April meeting during which residents opposed to the project pleaded with city councilors to slow the process by denying a zoning change that would allow Nordic to start applying for permits. The council voted unanimously in favor of the zoning change, arguing that the public’s questions and concerns would all be answered during the permitting and approvals process. Town officials said denying the zoning change would have caused a delay that could have killed the project. Nordic is planning a farm that would produce 33,000 tons of Atlantic salmon per year. The company is buying about 40 acres off Route 1 near the Northport town line from the city’s water district and a private owner. Several residents who spoke at the zoning meeting said they felt the farm would destroy “pristine” wooded area around the reservoir. Many said they were frustrated about unanswered questions related to water usage, waste discharge, building size and more. Nordic said it needed zoning approval before it could proceed to the permitting process, where all of these questions would be answered. In the three months since announcing plans to purchase the site, Nordic has been digging test wells and studying the topography of the area to decide how to lay out its buildings and determine whether there was enough water under the site to fuel the project. Heim said that test wells indicate the company could sustainably draw about 1,200 gallons of water per hour from the aquifer, an amount he said was consistent with many other industrial uses along the Maine coast. Nordic’s tanks will be filled with a mixture of saltwater from the bay and fresh groundwater, which will be constantly recirculated and filtered. The city’s water district has agreed to provide up to 260 million gallons per year from its supplies, which is less than it provided for the chicken farm industry in the past, according to water district officials. Nordic has said the water that it discharges will contain fewer nutrients than the water discharged by the city’s wastewater treatment plant. “The net discharge, after water treatment, will be significantly lower than the region’s agricultural run-off, and it will be lower than other discharge permits that have been previously granted in the area,” Hiem said. Heim said the building has been “designed to minimize visual impact,” and will stand about 10-15 feet shorter than surrounding trees. 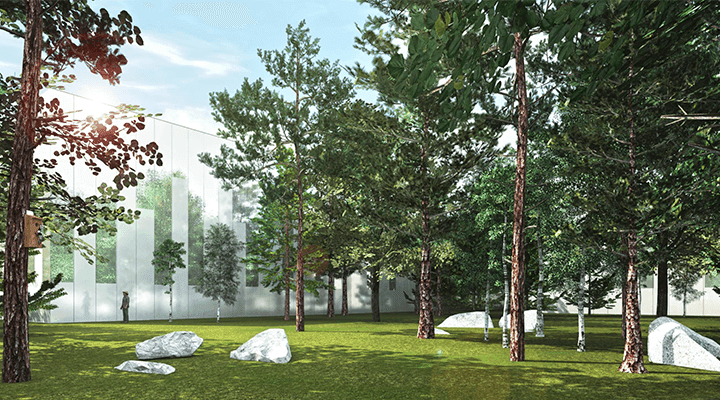 The building’s white walls and tall windows would be designed to reflect the surrounding trees. Nordic is in the midst of getting together permit applications from multiple state, federal and local entities, and that process will include multiple public hearings and public comment requirements. That process will last through the rest of the year. Construction on the first phase of the project, a hatchery, is expected to start sometime in 2019 if Nordic gets all its needed approvals.